We are a volunteer, non-profit organization whose mission is to provide BMX racing and riding to the community of Northwest Indiana. We began in 2000, as a small group of parents who wanted a place for our kids to ride their bikes in “extreme” fashion in a safe environment. Hence, Steel Wheels BMX was born – and consists of two USABMX sanctioned tracks. Steel Wheels Indoor, located in Hobart, Indiana and Imagination Glen Outdoor, located in Portage, Indiana. The outdoor track is co-sponsored by the Portage Parks and Recreation Department With their support – we offer practice nights, clinics, racing, camps full concession facilities, picnic and play areas and lots of fun activities from May through the end of September on our lighted, 1,100-foot track. In October, the whole operation moves inside to the indoor track – a 40,000 sq. foot facility that houses one of the largest, heated, indoor tracks in the country, as well as a full concessions and spectator area. The indoor track also features racing, practice nights, clinics and special events. Membership in USABMX is required to race at either track. The USABMX is a national sanctioning body for BMX and has over 300 tracks that are open for racing to all USABMX members. Membership is an annual fee of $60.00/person, and it includes a liability insurance policy, supplemental medical insurance policy, special awards for riders, a subscription to the BMXer magazine, online updates of rider points and proficiency and other benefits as well. Race fees are charged for races – they cover the track’s cost for trophies and awards, track maintenance & expense. (Updated fee schedules are posted at the track, online at www.steelwheelsbmx.com and in our schedules). To start riding, you need a 20” (or smaller) bicycle, long pants, long sleeve shirt and a helmet. (Some loaner helmets are available at the track). That’s it. Don’t be swayed or discouraged by the fancy uniforms and glitzy bikes – we all started with a bike, long pants, long sleeved shirt and a helmet. You can try racing one time on a special free one-day membership (only pay a race fee!) – we will show you what to do! Everyone pretty much races by his or her age and skill level (8 year old beginners rider with other beginners, etc). If you do get an annual membership – then we give you your first race for free as well as a practice for free ($21.00 total value!). The track environment is “family friendly! You will see kids, moms, dads, etc, all riding, cheering and hanging out together. Big kids, little kids, old riders and young ones – this sport is for everyone. We keep the facility family friendly as well – meaning no alcohol or drinking on the premises, no bad language or bad attitudes, no fighting – verbal or otherwise…plain and simple. You can bring a picnic basket in or purchase snacks from the concession stand – even your dogs are allowed – provided they are leashed! 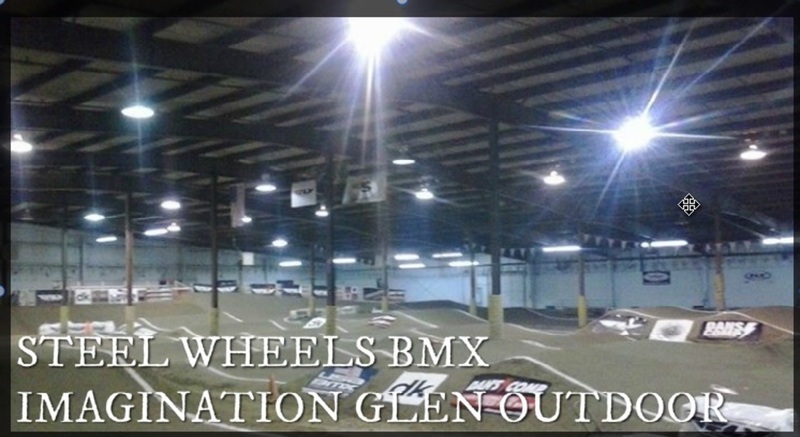 To contact us for further information you can visit us on the web at www.steelwheelsbmx.com; call 219-406-9833 or talk to anyone at the track.